On an evening when Bafana Bafana where given a frankly horrendous draw for the African Cup of Nations to be held in Equatorial Guinea in January (Algeria ranked 1 in Africa, Ghana ranked 5 in Africa and Senegal ranked 8th in Africa), there was some outstanding news as kit manufacturer Nike, along with the South African Football Association unveiled the new kit. The kit is a classic kit which is designed to encourage the team to push past yesteryear and inspire a new generation with the new Shakes Mashaba Bafana Bafana. 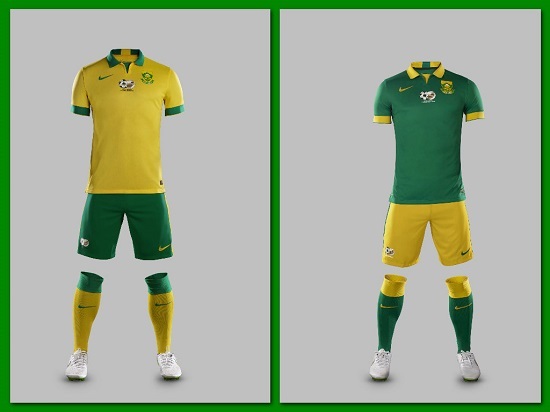 And to my pure delight the kits have gone away from white and embraced the national colours of Green and gold. I have written in the past about the importance of national pride and backing our national colours and Nike have delivered with a kit that will surely bring the pride our heritage deserves. The gold home jersey features a classic flat green collar with a single gold stripe on the inside back of the collar, and has green cuffs on the sleeves. The King Protea, South Africa’s national flower, is emblazoned on the left chest, with the SAFA logo centered below the front of the V-neck. The South African flag rests on the outer back of the neck. The away jersey is green, and is paired with gold shorts and green socks that use the same features as the home kit. The jersey and shorts feature a slimmer fit that more tailored to the body, enabling player to perform better without the moisture drag. Fans have responded in a positive manner to it as well. The kit also showcases Nike’s key technological features. The kits are crafted from dual-knit fabric consisting of both cotton and recycled polyester, helping to regulate player body temperature over the course of a match. Using a combination of Nike Dri-FIT technology, a ‘burnout’ mesh and laser-cut ventilation holes, designers are able to localize cooling where players need it most. The holes and mesh panels further improve performance by increasing air circulation to the players’ bodies and regulating their temperature through the 90 minutes on pitch. In line with Nike’s commitment to superior performance with lower environmental impact, the full kit features fabric made from recycled polyester. Each kit represents an average of 18 recycled plastic bottles, with 100 percent recycled polyester in the short and 96 percent recycled polyester in the jersey. Since 2010, Nike has diverted almost two billion bottles from landfills, enough to cover more than 2,800 full-sized football pitches. Nike designers utilized three-dimensional body scans of elite footballers to collect data on the form of today’s players and identify an updated fit to improve comfort and allow the body to move more naturally within the kit. The new Bafana Bafana jersey will be available nationwide from December 11. We say job well done!